My mum took these pictures of me last month – not a special outfit as such but just thought I’d share it since I haven’t been able to get any pics of my outfits this week (Merissa, I need you). And this really sums up what I’m into at the moment: black, leopard print, gold jewellery and my R&B bag, of course. I was after a simple black coat to match with everything, and Zara of course had the answer. It’s been a great winter coat and I love being able to just throw it on with any outfit, but its blackness definitely made me miss colour, making me prone to wear my red coat quite frequently. 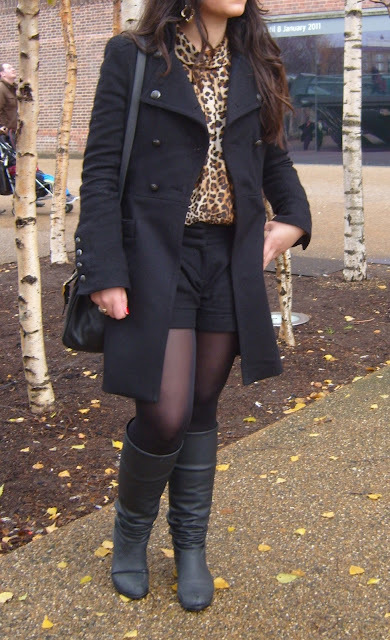 The leopard print top is also from Zara, one of my best sale buys this season. Come to think of it, I’ve actually bought very little during the sales. And I only just blogged about this outfit a few days ago! Here’s a reminder of it, and that big cheesy grin pretty much sums up how I feel about the picture. 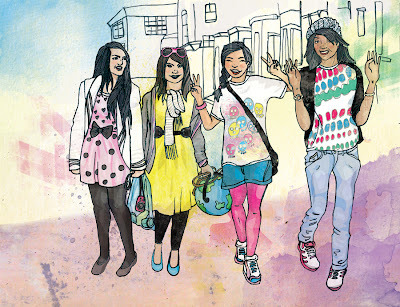 You really should check out Rachel’s blog, she’s an amazing fashion/children’s book/all-round illustrator, her work’s even been featured in Amelia’s Magazine latest coffee book, Amelia’s Compendium of Fashion Illustration. Can’t wait to get a copy! I love your bag an your blog! ooooo!! love love love that bag!